Vyacheslav Gaizer, head of the Republic of Komi seen ahead of a hearing into the investigation's request for his arrest on suspicion of fraud and criminal conspiracy at Moscow's Basmanny District Court. 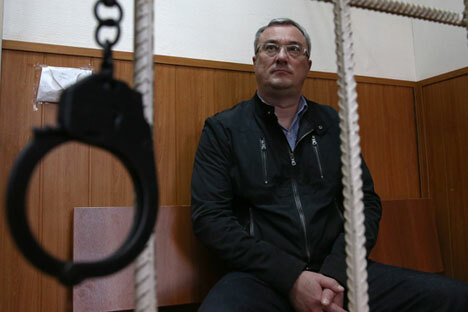 Law enforcers arrested Vyacheslav Gayzer, Governor of the Komi, one of Russia’s largest Republics, accusing him of putting together an organized criminal group (OCG). This is the first time in recent history that a Republic’s head has been accused of such a serious crime. Gayzer and 14 others from different regions have been detained. Russia’s Investigative Committee (IC) reported on September 19 that a criminal case had been opened against 19 members of a criminal group, headed by the Komi Republic Governor, Vyacheslav Gayzer. Fifteen suspects were taken into custody and one is under house arrest. The IC said they were trying to find and arrest the other accused. Among those arrested are senior regional officials: Komi’s deputy governor, deputy prime minister, head of the regional State Council and a former representative of Komi in the upper house of the Russian parliament. The accused have been charged under two articles, “criminal association” and “fraud.” The IC said investigators began to look into Gayzer’s activities nine years ago. According to ministry spokesman Vladimir Markin, IC investigators with FSB officers carried out over 80 raids in three Russian provinces, as part of the investigation. Vyacheslav Gayzer has been Governor since 2010, when he was recommended to the post by former President Dmitry Medvedev. He was re-elected in 2014, receiving 80% of the electoral vote. He is a member of the Upper Council of the ruling United Russia party. “More than 60 kilograms of jewellery, 150 watches worth between $30,000 and $1 million were seized”, as well as dozens of company seals “used to carry out off-shore schemes” were found in the raids. Also, “financial documents for legalizing stolen assets worth more than a billion rubles (about $15 million)” were discovered, Markin said. A source in the region’s law enforcement agency told TASS news agency: “The case against Gayzer was built over several years bit by bit from material from corruption cases opened against high ranking government officials, and city heads”. According to the source, “Team Gayzer’s” interests extended to numerous profitable businesses in energy and housing. Gayzer and his associates are suspected to have illegally privatized a series of enterprises in Komi, including poultry farms and hotels. The case also refers to illegal schemes for a range of other companies. The Gayzer case is testament to the ineffectiveness of the fight against corruption, said Vladimir Rimsky, an investigator dealing with problems of corruption from the INDEM Center, in an interview. “The most important thing here is that even according to official reports the Investigative Committee, which includes more than a dozen officials, was working for nine years. Either it did not function and this is all made up, or if it was operating, then everyone [in the region] should have known about who is associated with the property and public procurement. None of this was [known]" Rimsky said. He believes the issue is a group of corrupt officials, but not an organized criminal group in the precise sense of the term. Rimsky thinks that it was only after the arrest of a group of senior officials from Komi that the case was presented as an organized crime group. If it really was an OCG, then its existence for so long is indicates poor law enforcement. According to Kirill Kabanov, head of the National Anti-Corruption Committee, who formerly worked in law enforcement, to accuse an official like a governor requires “long and painstaking police work to gather evidence.” “In this case, we are talking about a person who was nominated by the President. Therefore, a full package of documents needs to be provided to the President”, said Kabanov, explaining why Gayzer’s arrest had taken so long. Kabanov said the use of the article on organising a criminal group is in this case adequate and the most rigid article that describes the essence of corruption, as a “multi-level business” based “upon receipt of revenues from the government budget.” Kabanov said corruption schemes are highly organized, and include both government officials and businessmen. He said that there are gaps in the Russian Federation’s Criminal Code and no other article would punish embezzlement of state funds in proportion to the gravity of this crime.